Coming up with new titles and authors to read is a challenge–particularly if you are the book group/club leader and the members look at you and say, “Well, Mr./Ms. Expert, what should we read next?” Fortunately, the other members of the group I facilitate are usually reliable when it comes to making suggestions for us to vote on. Even so, there are times when we have a collective mental block. When that happens, it is a good idea to broaden the pool of opinions, and there are a lot of knowledgeable people out there who compulsively compile lists of books for the rest of us to read. But which list is the best? What about the list I have on this site of the books the group has read? Isn’t that good enough? Our list is focused on literary works, but how do you determine if something is “literary”? Although there will always be room for debate as to which specific books are literary, I view a work as having literary quality if the writer has said something insightful regarding human nature, i.e., what does it mean to be human? What are some qualities that differentiate us from other species? Why do certain traits of a character stand out? Is the story one that makes us really think? When Harper Lee wanted to tell people about the different aspects of racism, she was singling out an ugly aspect of human nature to examine through the use of a compelling narrative. As a result, To Kill a Mockingbird has had a long-lasting impact. In that sense, not only did she write a literary novel, but a classic as well. 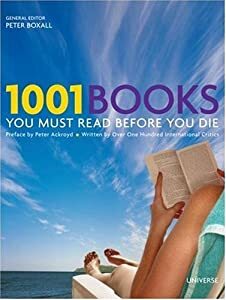 1001 Books for Every Mood – Hallie Ephron, Ph.D.
Every year, new awards are handed out, but it’s the press releases by the award committees announcing the “short lists” and “long lists” of authors and works under consideration that I find even more useful. The literary world is full of politics, egos, and internal intrigue so it is common for truly great works to get passed over. The New York Times publishes several reviews each week, and I have been on their emailing list for so long that I have managed to avoid paying for a subscription. Lastly, bookstore owners, librarians, and teachers are excellent resources. Some bookstores go to the trouble of devoting a separate area of their establishment to classics. If you can find a local university bookstore, walk through the aisles and note the works that professors are assigning. One friend of mine posted a query to people on Facebook asking for reading recommendations and she ended up with an excellent reading list. Once you have tried some of these strategies, I guarantee that you will have more than enough reading to keep you busy. Just don’t forget to read this blog, too!